After the initial consultation, we have a good idea what you are looking for. At this time, it is necessary for us to invest our time into your project. Assessment of a design fee of 10% of the total project estimate will be set to continue forward. This fee is non-refundable. Time spent in this planning & design phase is never wasted, and we will always be happy to share and discuss ideas. When a fee is charged, a deliverable is expected. We will provide our best sketches and samples of your selected stains and finishes as a deliverable. The deliverable plans will suffice for us to follow the job through to completion, but may not be easily transferred to other craftsman. We are used to working from simple sketches and measurements, we rarely complete full architectural drawings. If we are working from photos or plans on period furniture, we will use these resources as the basis for the work, and establish all critical measurements for your review. Pricing will be based upon the final design drawing, not the photos provided. On occasions when customers provide complete plans, we will provide pricing based upon these plans after a site inspection, if required. Each project may be unique in the customers needs, but our experience and background has exposed us to common solutions for unique problems. Problem solving is one of Eric's specialties, and to him, coming up with unique ways to use space is like solving a fun puzzle. All pieces are completed based on Artisan's best interpretation of the client's needs, specifications, and plans. Finished products created from pictures or sketches are especially subject to interpretation. Site visits will be required for custom built-in work, for both measurements and installation. Large projects may take several site visits to complete installations; we may require workspace for a variety of portable equipment. Please note that travel time over an hour will be billable. During the design phase, we will determine if any subcontractors will be required to complete the job. Common use of subcontracts will be for glasswork, metal fabrication, or countertops. We can design space for artistic glass, however you must work independently with the subcontractor for designs. We can design and specific requirements for metal fabrication, however please discuss prices and final directly with our affiliates. In addition, we are happy to provide approximate measurements for countertops, but there will be a template fee assessed by our subs for countertops. 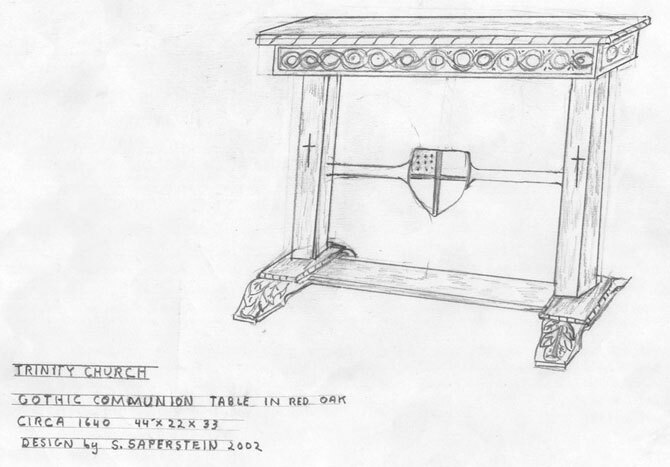 This table is a custom commission of a solid oak Gothic Sacracy or Communion Table for Trinity Church of Princeton, NJ. The finished piece is shown in our Period Furniture Section. The design of this 44 x 22 table is an original Artisans of the Valley creation by Stanley Saperstein. The sketch begins to show the form and artistic concept of a piece, giving our clients a working visual of our ideas. This piece includes a sculptured code of arms within the I-beam structure, extensive leaf, rope, and floral carving, and applied crosses for religious symbolism. This piece is a classic example of period furniture, so we plan to follow this project through the entire lifecycle from this sketch through delivery on our website. This is the first concept drawing of a custom cherry Armoire designed to accommodate drawer space, shelf storage, and act as a bedroom entertainment center. This piece can be offered in plywood solid combination or entirely in solid wood. 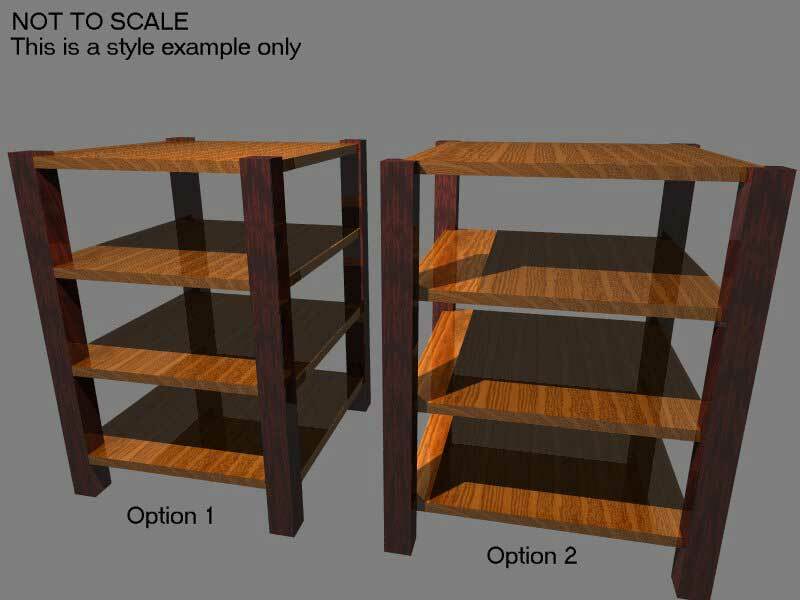 Suggested materials are birch, cherry, mahogany, or oak.